Good morning. We only celebrated the 21st anniversary of the establishment of the Hong Kong Special Administrative Region (HKSAR) a week ago, and last evening I attended the celebration of the 20th anniversary of the Hong Kong International Airport. 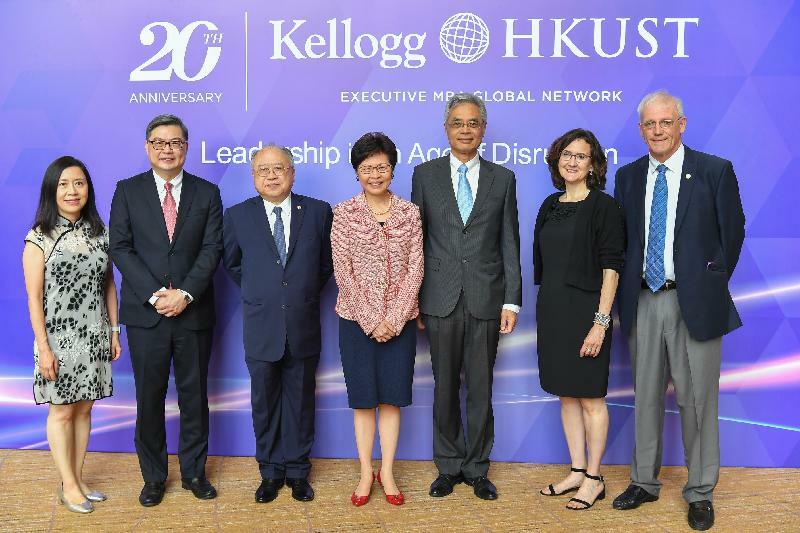 So it really gives me great delight to be here this morning to join all of you to celebrate the 20th anniversary of such a distinguished programme, the Kellogg-HKUST Executive MBA, and I know you have a full day of discussions and fun, hopefully, during the gala dinner. HKUST by itself is a relatively young university, but over the years this university has really made us proud, having been voted many times into the top 100 or even the top 50. 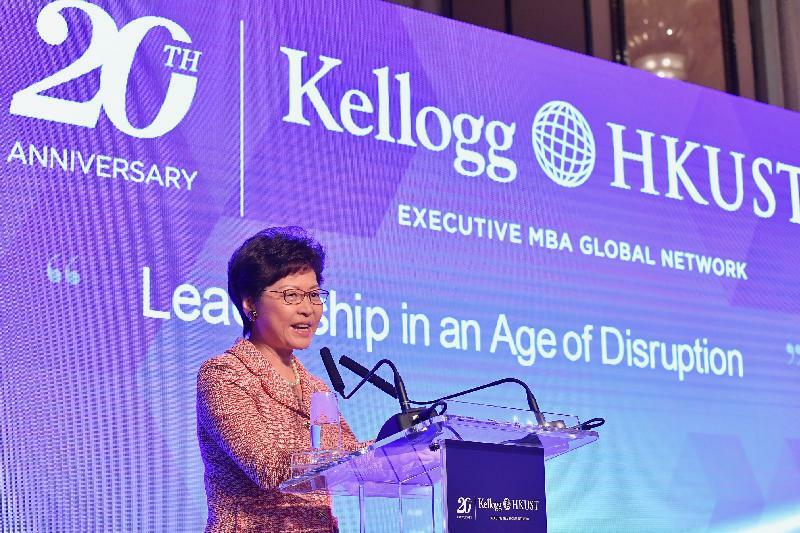 The Executive MBA Programme is even more illustrious to be ranked number 1 in the world by the Financial Times - not for one year, two years, three years but for eight years – so let me just commend and congratulate the Kellogg-HKUST Programme. All these wonderful achievements would not have been possible without the great work done by the Council Chairman, the President, the Dean, the Faculty, both past and present, of course including my former colleague, Professor KC Chan, who is here today. I notice that the theme of today's conference is "Leadership in an Age of Disruption". It is very timely because just 24 hours ago the law and order on the multilateral trade system and the economic globalisation have been disrupted by one single country. I am not going to talk about this trade war, except to assure you that Hong Kong will stay alert to assess the implications arising from the trade war, the sanctions, the tariff increases and so on, and get ourselves ready if there are things that the Government could do. But it does remind me of a statement, a very powerful statement, made by President Xi Jinping at an international forum. He said of course you could close the door in order to keep the wind and the rain away, but by closing the door you are also denying the people in the room of air and sunshine. The implications are something that we should all ponder on. Coming back to Hong Kong, I have been in the Government for 38 years now, so you would have imagined for somebody like myself, who have been in senior executive positions for quite some time, that the Government would be willing to send me to some MBA programme, either in this very illustrious Executive MBA programme of Kellogg and HKUST or the Sloan programme, to which the Government is still sending senior colleagues, or the Harvard Business School programme, but unfortunately I have attended none of these programmes. I am more or less a self-made senior executive or leader. So I am going to spend the next few minutes to share with you my experience, or how I sort of nurtured myself to become a senior executive without the benefit of the MBA programmes, especially now that I am in the position of the Chief Executive of Hong Kong. As you know, I have just finished my first year in office and when I started this job, the first thing as a leader is you need to have a vision for Hong Kong, just like all of you who are in key businesses, you need to have a vision for your corporation. My vision for Hong Kong is very simple. It is for a Hong Kong of hope and happiness, a city that we are proud to call our home - a vibrant international metropolis that is just, civilised, safe, affluent, enjoys the rule of law, compassionate, and well governed. But these words are easier said than done. In order to achieve that vision, I have derived or designed for myself and my team what I call a new governance style, new government roles, and a new fiscal philosophy. Having been in the job for one year, let me share with you a few concrete examples of what I mean by these three new things. On the new governance style, for my team, when we first started off, I have to align our style to be one which is caring, willing to listen and determined to act. There is no point to care and to listen but not willing to act. Or in Chinese, it is called "議而不決 決而不行". So "action-oriented" sort of describes my Government in the first year of office. At the same time, we adopt features of being innovative, interactive, and collaborative, because nowadays, especially in the public sector, issues are very complicated. There is no issue which is neatly and nicely within one bureau or one department. There are many cross-bureau and cross-departmental issues that we need to address and solve for the people of Hong Kong. Take for housing, housing is not just an issue for the Transport and Housing Bureau. Housing requires land, so I need to bring in the Development Bureau to work with the Transport and Housing Bureau to jointly address the housing issue in Hong Kong. Take another example, we want to provide better care for young kids, normally within the age of 2 to 4, who are suffering from developmental delays or autism. And this is really a cross-bureau initiative between the Education Bureau, the Social Welfare Department and also the Health Department. And as a result of that, we rolled out a very encouraging programme to deliver services, that is early rehabilitation services, to kindergartens where these kids are, so that they can receive rehabilitation service at an early juncture. This is the result of three bureaus and several departments working in concert. The second feature of my Government is new government roles. Many of you in the audience have heard and I said that for a long time now, that any government would have to perform the role of a public service provider, whether it is the education services, in medical services or in transport services. The government also has to be a regulator otherwise it will not be in order whether it is in the financial markets or in other services. But in a highly globalised and competitive environment, any government, any responsible government, will have to take on some additional roles. I have suggested and advocated that the Government should adopt two new roles. One is that of a facilitator, and the second is that of a promoter. As far as government facilitation is concerned, for example, we now provide one-stop service for innovative projects that the project proponents are not sure where to go to get some government advice. Similarly, for innovation, we want more innovation in the Government, but where is that drive for policy innovation? So I have created a little unit called the Policy Innovation and Co-ordination Office to provide the first-stop and one-stop service for innovative projects from the private sector and from the non-governmental organisations, so that we can take forward those projects within the Government. Similarly, in terms of facilitation such as in the building, lands and planning aspects, to facilitate the building process, we also need to do more facilitation. I can go on and go on about the examples on where Government could perform a facilitating role in order to enhance our competitiveness, but it is in the role of promoter that I find it most gratifying. In my first year of office, I have made a total of 22 trips outside of Hong Kong, so about 20 per cent of my time as the Chief Executive was actually spent outside of Hong Kong, both in the Mainland - Beijing and other cities - as well as abroad. And I have attended four international conferences already by now, including the APEC Economic Leaders' Meeting, the Davos World Economic Forum, the Boao Asian Forum and the ESCAP of the United Nations. On every occasion, I promote Hong Kong, naturally, and talk about Hong Kong's unique advantages under "One Country, Two Systems", and also try to dispel any misperceptions about the relationship between this Hong Kong Special Administrative Region and the Central Government. This promotion role is very satisfying, because normally it's not just going to talk. We could identify opportunities for collaboration, particularly in the area of innovation and technology because many people outside of Hong Kong will never associate Hong Kong with innovation and technology. Yes, Hong Kong is a very international financial centre, a very important business hub, a good place to visit, but science and technology seems to be quite far away from Hong Kong. One year down the road I have to say that we are now getting a little bit of reputation and have the aspiration and the ambition to become an international innovation and technology hub. Two weeks ago in Paris, we sealed off a co-operation arrangement with Institut Pasteur, which is a very famous research institute focusing on vaccines, and Institut Pasteur will collaborate with the Hong Kong University medical school to set up a centre in the Science Park as part of our critical mass or cluster on health technology for Hong Kong. On the new fiscal philosophy, it is even more tangible, because it is talking about money. I have a very different concept about money, especially public money. I said that spending is not quite spending - you can regard it as investment. It does yield return. Building the HKUST is a great return for the community. Of course the money came mainly from the Hong Kong Jockey Club then, but it's a great return for this city and for our younger generation. So the first policy area that I spent was on education. I put in $5 billion extra recurrent expenditure, now raised to $7 billion recurrent expenditure, for education, all the way from kindergarten education to higher education, and with a bit of luck, I'll be able to get about $11 billion capital expenditure for the universities to build hostels. So keep up your lobbying, Professor Shyy Wei, with the Legislative Council Members so that I could get it before the summer recess and you can start to build your hostels in order to welcome more international students as well as to meet the needs of local students for hostel life. And likewise, on the revenue side, revenue is to help us to sustain the Government's expenditure. But revenue, especially in tax, is also a very good instrument to achieve economic and social objectives. So, within the period of one year, we have introduced two tax concessions. One is to replace the flat rate 16.5 per cent for profits tax by a two-tier profits tax regime - for the first HK$2 million profit we are charging only half of the 16.5 per cent, that is 8.25 per cent, which is very good for start-ups and SMEs in Hong Kong. The second tax concession which is waiting for the Legislative Council to approve is tax deduction, a super tax deduction for private corporations' expenditure on R&D. For the first time in our tax history, we are giving super tax deduction, that is, we will give you a deduction more than you have actually spent. For the first $2 million of R&D expenditure by corporations, we will give a 300 per cent tax deduction. Beyond the $2 million, it will be a 200 per cent deduction and there is no upper limit to how much you will benefit under this tax concession. On the economic side, we want to promote and develop the bond market. The Financial Secretary has introduced a couple of initiatives to give subsidy and grants to attract bond issuance to Hong Kong, especially green bond. We are going to provide some subsidy to defray the expenses to get certification from the HKQAA (Hong Kong Quality Assurance Agency) Green Finance Certification Scheme. These are some of the examples to demonstrate to you that when we said we have a new governance style and we want to play some new roles and practice a new fiscal philosophy. A lot of those ideas have been put into action in the last 12 months, and we will continue to do so in the remainder of our term because I am extremely confident and optimistic about Hong Kong. In fact, to be a senior executive or leader, whether in the public sector or in a corporation, you have to be very optimistic, you have to be very confident in order to lead your team. In a way I would describe my role also as a cheer leader. So I am going to show you a three-and-a-half-minute video that I have been using in overseas promotion to demonstrate that the best of Hong Kong is yet to come.